The new Center Street Parking Garage is located between Milvia Street and Shattuck Avenue. The Center Street Garage is not offering validation to anyone at this time, so we do not validate parking there. After 5pm the Center Street Garage has an $8 flat rate, only a $3 increase to the Allston Way Garage if you choose to park closer. Allston Way Garage, at 2061 Allston Way, is accessible via Center Steet. Ask for a Validation Coupon at the Box Office for your parking fee to cost $5! Regular evening rate is $15. Promenade Garage on Addison Street between Milvia and MLK, Jr. Way. Enter after 5pm on weekdays and parking is just $8. Berkeley Way Garage is located at Berkeley Way and Shattuck. Parking is $.30 for 12 minutes, Maximum 6 hours. Oxford Garage is on Kittredge Street between Oxford and Shattuck. Enter after 5pm and parking is just $4. UC Golden Bear Lot & Garage on Bonita between University & Berkeley Way has parking available on the surface lot until 2 am each day. The garage is now also available to the public for parking until 12:30 am. 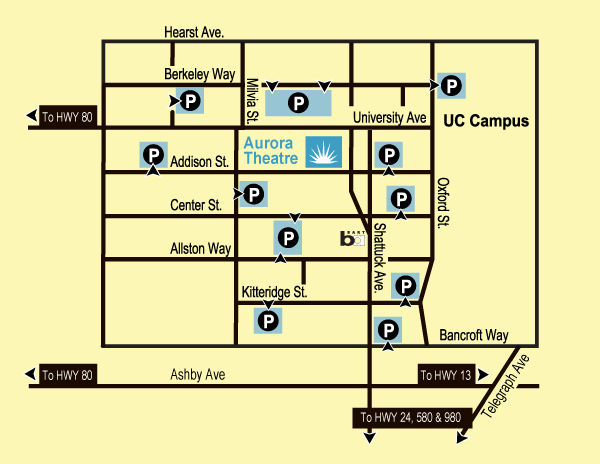 Download Aurora's complete Parking Guide from the link at the right. Take the Bay Bridge, to I-80 East towards Berkeley/Sacramento. Exit on University Avenue. Go east, towards the hills, 2 miles to Shattuck Avenue. Turn right on Shattuck Avenue, go one block to Addison. Turn right. Theatre is on the right. From Highway 24, take the Berkeley Exit: Highway 13, Tunnel Road/Ashby Avenue. Drive West on Ashby to Shattuck Avenue. Turn right on Shattuck Avenue, proceed 2 miles to Addison. Turn left on Addison. Theatre is on the right. Take I-880 North to I-580 West to I-80 East towards Berkeley. From I-80 take the exit on University Avenue. Go east, toward the hills, 2 miles to Shattuck Avenue. Turn right on Shattuck Avenue, go one block to Addison. Turn right. Theatre is on the right. Take the Richmond-San Rafael Bridge onto I-580 to I-80 West. Exit on University Avenue. Go east, towards the hills, 2 miles to Shattuck Avenue. Turn right on Shattuck Avenue, go one block to Addison. Turn right. Theatre is on the right. From Oakland/Fremont, take a Richmond-bound train and get off at the Downtown Berkeley station. From Richmond, take a Fremont, Millbrae/SFO or San Francisco/Daly City train to the Downtown Berkeley station. From San Francisco, take either a Richmond train and exit Downtown Berkeley station, or take a Pittsburg/Bay Point train, transfer to Richmond train at Macarthur Station and exit Downtown Berkeley. From Concord/Walnut Creek/Lafayette, take a San Francisco/Daly City train, transfer to Richmond train at Macarthur station and exit Downtown Berkeley. After exiting the station, head north on Shattuck Avenue to Addison. Turn left. Theatre is on the right. Check BART for schedules: (510) 465-2278 or www.bart.gov. Major AC Transit routes F, 1, 1R, 7, 12, 18, 25, 49, 51B, 52, 65, 67, 88, 604, 605, 800, 851. Call 511 for schedules and information.